We have a ghost at home. Great. It has been a couple of weeks (almost 3!) since my last post- the longest I’ve gone without writing since I started this blog. Well, a lot has happened and thanks to a MAS stewardess friend, I’m glad to be reunited with my lappy last night and to be once again tapping away on these little black keypads. To continue with the story (as per the title of this post), in the recent days running up to our departure for London, I began noticing more and more strange occurrences at home- mind you, it’s nothing that I hadn’t felt before; as throughout my life I’ve always been a bit more ‘sensitive’ when it comes to these sort of things. Call me mad but I’ve always had somewhat of a 6th sense, yet I’ve generally often comforted myself that all these strange occurrences (i.e shadows, chills, noises, dreams etc) have perfectly logical and rational explanations. But when you have a baby who also reacts to all these things and more, it becomes something a bit harder to ignore. Eeks. In addition to this, I started to realise that for someone who has only been with us a few weeks, Celia also seemed to know a lot about us. A bit too much even. At first I put it down to her being ultra-perceptive and observant, but she would often bring up things that there would be no way for her to know about unless she had been there herself, so I was joking with my family on our group whatsapp chat that “I think Celia is psychic”. True enough, one day I felt a strong presence in the room- more so than normal and I asked her, “You don’t think there’s anything strange here, do you?”, expecting her to brush me off and tell me “of course not, don’t be silly”. 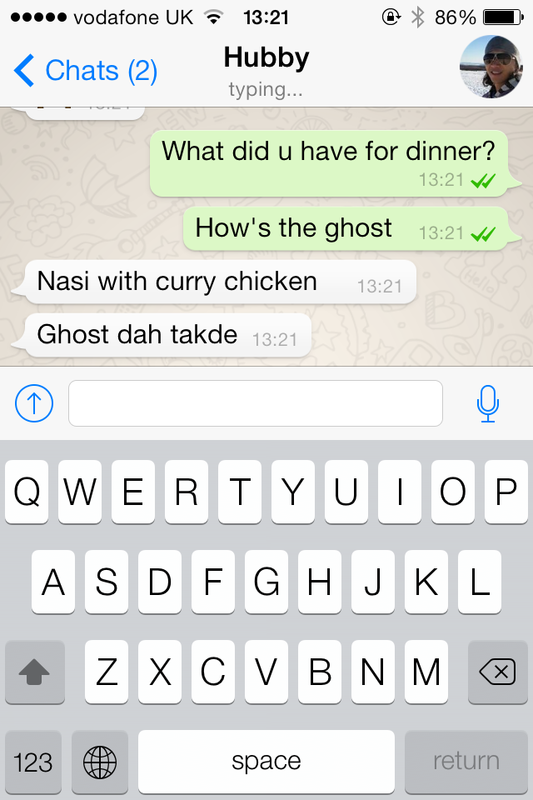 So when she replied, “Oh you mean the ghost? He is here. You feel it now too?”, I almost peed my pants. I found out that back home in the Phillipines, Celia was a well-known ‘healer’. She is even known amongst the Pinoy community in KL for this, so every weekend, scores of people would visit her hoping to be healed of their (strange and usually inexplicable) ailments. Wanting to know more about the supernatural side of things, I started grilling her about it. Apparently, one night years ago she dreamt of Jesus (Isa Alaihissalam) and Mary (Maryam Alaihissalam) and after that she was able to not only “see things” but to also help people. So thanks to her ‘gift’, she was able to confirm that seemingly we have a ghost that just loves to be in my room and it freaks Aidan out. Fantastic. Today I whatsapped my hubby and realised how normal the presence of our unwanted guest had become. I hope and pray that by the time we come home from London, the ghost (and any friends he may have) will be gone so we can live our lives in peace! In the meantime, the Verse of the Throne will be our new BFF! “Allah – there is no deity except Him, the Ever-Living, the Sustainer of [all] existence. Kursi extends over the heavens and the earth, and their preservation tires Him not. This entry was posted in Being a mum, Controversial, Family, God, Hubby, WollyLife and tagged Angels, Ayatul Qursy, Christianity, Diyana Abbas, Ghost, Islam, Jesus, Jinn, London, Quran, Religion and Spirituality, Spiritual Beings, Surah Al Baqarah, Surat, Verse of the Thrones by diyanaabbas. Bookmark the permalink.